Hello all, and sorry for the delay in getting to this final installment. It's been a busy two weeks, and as much as I enjoy writing these for you, you lost out to visiting my wife and kids for a few days. But, I'm back, and finally ahead enough in my classwork to get back to the topic of the Joint Operating Principles, and what we can learn from them when studying military history. A reminder, you can find the previous posts in this series here, here, here, and here. Read them and catch up if you haven't, as I am not going to rehash the details I've already covered. However if anyone with anything to say in the military, had ever studied either Jomini or Clausewitz for other than mere amusement, we would never have experienced an Iraq invasion. I do not mention this example to make any political statement whatsoever, I am just giving words to the obvious and objective. One can only conclude, that in our day and age wars are not waged by educated people. The soldiers and officers might be, but it doesnt matter, at the end of the day. With this insight its even more interesting to read this article. Gives it more dimension and perspective. Makes one think. Thanks for the comment, Lasse. It certainly does make one think. You say you're not mentioning this example to make any political statement, but let's be honest--there's nothing NON-political about it. It's extremely political, and as an active-duty US Army officer with my name signed to this blog entry, I've got to be careful in how I respond. But it does deserve a response, and not just in the comments section where no one will read it. First of all, I can attest that people in the military study Jomini and Clausewitz, because I'm in a school (ILE) doing the very thing right now. This series of blogposts fulfills a class requirement, in fact. And from the looks of my classmates when we come into class in the morning after reading Clausewitz, I might be the only one who WOULD read it for amusement. Our entire military institution is founded on a combination of Clausewitz and Jomini; to this we add the experiences of the US Civil War, the Prussians, the World Wars, and everything since. The statement that "wars are not waged by educated people" is patently ridiculous, and highly insulting, considering one of those people is the person to which you are responding. It's a valiant effort to caveat it by saying "the soldiers and officers might be", but it falls short. Way to paint with a broad brush, and to say your statement isn't political is disingenuous, at best. It's extremely political, and there are much better ways to refine and express your viewpoint than calling the military a bunch of idiots. THAT SAID--and here's where I have to be careful, with government rules and all--it's perfectly valid to criticize the decision to go to war in Iraq as a failure to adhere to Clausewitzian thought. There were certainly plenty of people who raised doubts, chief among them Secretary of State Colin Powell. However, the biggest blunder, in my opinion, wasn't whether or not to go into Iraq--that's a different question, and is exactly the political discussion I'm not going to go into, because it's not the purpose of this blog. The biggest blunder was not understanding what our endstate should be, and what would be required to get there. In that, we failed to adhere to several Principles--most agregiously, Objective. Considering the 3 new Principles (Legitimacy, Restraint, and Perseverance) were added AFTER the Iraq and Afghanistan experiences, they're obviously the military's response to lessons learned from failures in those two campaigns. 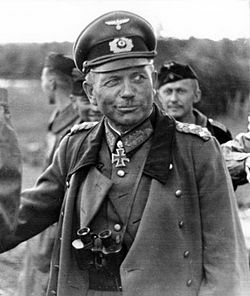 Guderian feels your pain, Lasse. The problem with the decision to go into Iraq is not that military leaders did not study Clausewitz--they did, and many brought up the appropriate objections. But here's where Clausewitz really shows us what happened--because as he says, war is a continuation of policy by violent means. If the policy is bad, then it doesn't matter how well the warfare is conducted. And that is the root of the issue, and why this CANNOT be separated from politics. Ask the Wehrmacht in WWII, they know very well--great operational and tactical army that lost because it's political leader decided to fight on two fronts and meddle in plans. I am not comparing the US political leadership to Hitler, let's be clear--but simply using that as an easy example of misguided strategic objectives derailing capable military action from the get go. Bottom line--I have no idea if President Bush and SecDef Rumsfeld studied Clausewitz. I would bet that at some point they did. But no matter how much you study something, there's the possibility that you might make decisions that conflict with it. Anyways, thanks for the comment, despite the jabs you may or may not have intended at me, Lasse. It's no coincidence that US Military doctrine has changed dramatically over the last decade since we began the wars in Afghanistan and Iraq. If anything, I would hope that the fact that the new principles are now institutionalized and being taught in military education should give you some hope for the future. 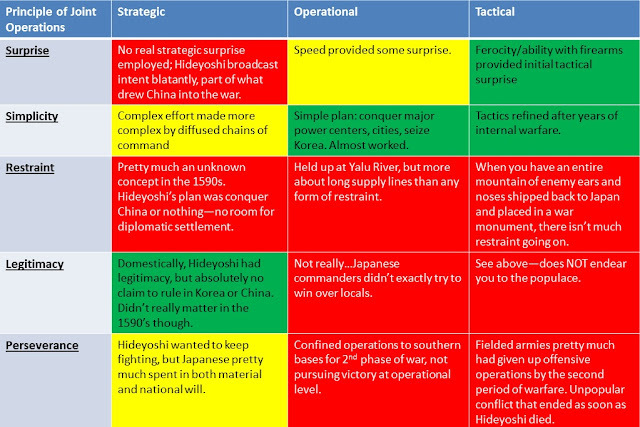 ....so if you predicted "Hideyoshi's invasion of Korea", give yourself a pat on the back. I'm guessing a grand total of ZERO podcast listeners and blog readers guessed that one. I was thinking about going with Nagashino, as that's my pet project and would be easiest for me. But there are rumors that people are tired of hearing about Nagashino...I know, how could that be, right? Still, I thought a change of pace might be nice, so here you go. 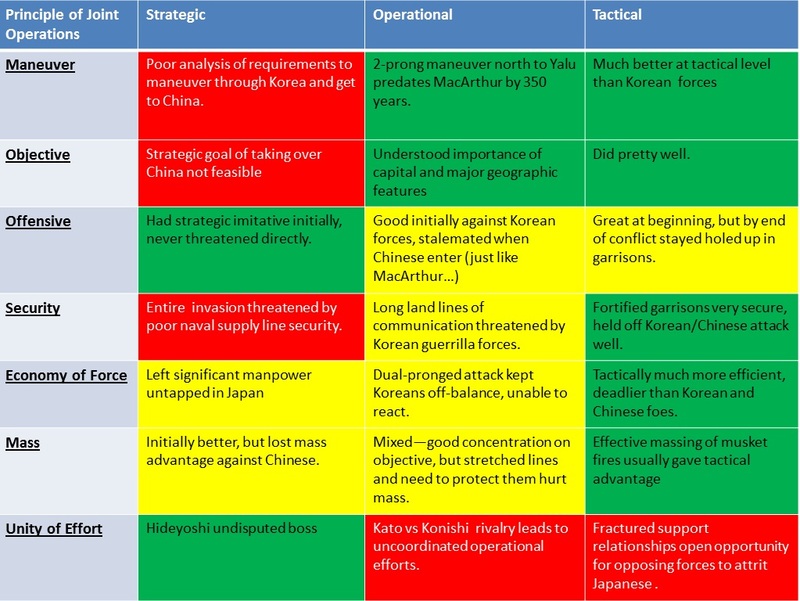 I won't go into the specifics of what I threw into each block in the chart, but as you can see, I broke the Japanese invasion of Korea (1592-1598) into the three Levels of War (Strategic, Operational, and Tactical) and looked at each Joint Operations Principle in those areas. I then rated the Japanese performance in each Principle based on my assessment of how it worked out for them. Red is obviously worst, Green best, and Yellow means there was good and bad. Looking at the charts, two things stand out to me. Hideyoshi studies the map with his generals. Was he the weak link? 1. 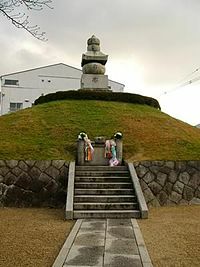 If you look at the old 9 Principles of War, Japan did fairly well at the tactical level, and decently at the operational level, with only Unity of Effort really suffering from the rivalries between different field commanders (primarily Kato Kiyomasa and Konishi Yukinaga, though there were others). What really hurt them, if you stick to the original 9 Principles, was the strategic level--in other words, the Wehrmacht also sympathizes with Hideyoshi's field commanders. 4 of the 9 Principles (Maneuver, Objective, Security, and Surprise) get a red rating from me, and only 2 (Offensive and Unity of Effort) get greens--and those could be argued pretty easily. Much like Germany in WWII or France in the Iberian Campaign of the Napoleonic wars, Hideyoshi's army was superior to their Korean and Chinese foes at the tactical and operational levels, but failed miserably at the strategic level, setting his objectives way too large without really understanding the magnitude of what "subduing all of China and becoming the Chinese emperor" really entailed. Certainly some blame lies with his CIA chief. 2. Looking at the 3 new Principles of Joint Operations (Legitimacy, Restraint, and Perseverance), these were red across the board for the most part. And considering we in the US military are just now making them a part of our doctrine, this isn't surprising. After all, it is not as if anywhere at this time saw the exercise of Restraint as part of it's official military posture. The violence of the Thirty Years War in Europe was testament to that on that side of the world. Legitimacy was important to Hideyoshi's domestic political power (as we discussed previously), but he didn't exactly need to justify himself to the Korean people in order to take over their country, at least not in the context of the day. And yet...I can't help but wonder if some attention had been paid to these factors, perhaps Hideyoshi's road would have been a little easier. Rather than simply decide he wanted to invade China, and oh by the way Korea you're going to help me or we'll kill you first, what if he had legitimate reasons (abuses by Chinese government against Japanese traders, perhaps) to go to war with China? Korea might not have offered to serve as a highway for the Japanese, but the political response might have been different. What if, instead of collecting ears and noses from Korean prisoners to ship back to Japan as evidence of martial prowess, the Japanese commanders had, I don't know...shown some compassion and Restraint in their dealings with the local populace, perhaps even implementing favorable taxation and agricultural/economic reforms compared to their rule under the Korean court? Is it conceivable that the Korean peasantry and local land holders would have decided life under the Japanese was better than under their own king? Nationalism in most places was not a strong concept, so assuming loyalty to the Seoul court by Korean farmers in the Pusan area may not be accurate. Finally, what if Japan had the domestic will to Persevere in the Korean conflict and continue the fight after Hideyoshi died? 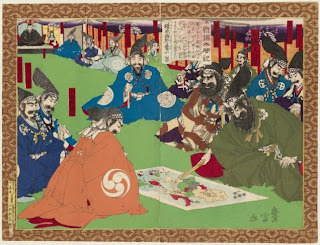 The Japanese domestic political situation makes this highly unlikely, but had Hideyoshi had a strong succession instead of the boondoggle that occurred, it might have led to a Japanese/Korean version of the Hundred Year's War. Or not--but the point is that consideration of these factors, even though we don't expect to see them in 16th century warfare, is interesting--if only to highlight how different our ideas of warfare are today. Does this exercise tell us the exact reasons the Japanese invasion of Korea failed? No, not in detail--but it suggests places to look, and that's the point. Military professionals (systematically since the time of Clausewitz, Jomini, and the Prussian War Academy model was adopted by everyone in the late 1800's) study military history to identify trends and understand principles in order to better fight and win their nation's wars. As Lasse points out in his comment, sometimes we can do this better, and we have to learn from those times. As a historian, however, you can flip the model around and learn the weaknesses, strengths, and the why of success and failure in historical examples. The Principles of Joint Operations, even those Principles recently made part of the doctrine, are useful as an analytical tool not just in planning future military operations, but in examining those of the past. Let's face it, as my history professor here at ILE says constantly: history echoes and history rhymes. The operations in Iraq and Afghanistan are not the first time larger armies have had trouble with insurgencies: Vietnam, French Algeria, the Philippines at the turn of the 20th century, the US Civil War, the Iberian Campaign in the Napoleonic wars, the US Revolutionary War...and (relating back to Japanese history) the Ikko Ikki fighting Nobunaga, the campaigns of Kusunoki Masashige, and even the Bakumatsu period pro-Meiji revolution are all examples of successful and unsuccessful insurgencies. I'll join Lasse in his criticism of the military's study of history--there really shouldn't be anything "new" about Afghanistan or Iraq, because we've seen it all before. I won't be pretentious enough to say we've learned our lesson, because history shows that eventually we'll forget it again. However, the more we study it, the easier it will be to remember it when the time comes. Thanks all, hope you've enjoyed this series. Try looking for these Principles in other places--for instance, do you ever get tired of seeing the same commercial 15 times in the span of a 1 hour television show? That advertising agency is practicing MASS, betting that even though you are annoyed (or because of), you'll remember the product. I'll be back eventually with another series, I'm sure, but in the meantime feel free to comment (and Lasse, I'm just picking on you--seriously, I do appreciate the comment) and keep the discussion going, but keep it civil. And with that, mata ne!